Four magicians collectively known as the Four Horsemen pull of a bank heist in the midst of their show and draws the attention of the FBI agent, an Interpol detective and a former magician who earns his keep by revealing other magicians’ tricks. First of all, JESSE EISENBERG! OMG I just love it when he rattles off like nobody’s business. There were a group of girls screaming for Dave Franco but I’m not really into him. Sure, his fight scene with Mark Ruffalo has got to be one of the most unusual and original ones I’ve seen. Flash paper, a slicing deck of cards, mirrors and all sorts of magical apparatus were used in this fight. It is perhaps a little hasty to give it such a high score but my mind was really blown after watching this movie. On hindsight, it seems a little all-over-the-place and the conclusion may be a little hasty because I figured it completely during the end credits. What I liked what how they used simple magic tricks on a large scale (you have to watch to understand what I’m talking about). The whole thing may be a little mind-boggling but when was the last time your mind was boggled? 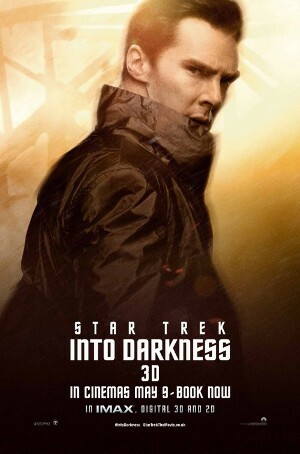 When the Enterprise faces a force of terror from within their organization, Captain Kirk leads his crew to Kronos to capture the man responsible – John Harrison. That’s just a really brief summary but I just want to shout out: BENEDICT CUMBERBATCH! 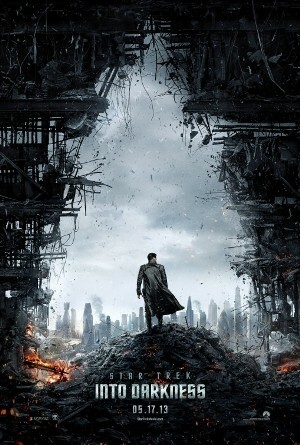 I didn’t catch the prequel to this so the main reason I’m watching this sequel is BENEDICT CUMBERBATCH. His role here is kept under wraps but we do know he antagonizes Kirk and his crew so this villainous role must be juicy! He even does some hand-to-hand combat here which really enhances the biceps of BENEDICT CUMBERBATCH. Throughout the movie, you will question his motives and actions but it is all worth it. The script is well-written and the action scenes pack a punch. Even the bromance scenes between Kirk and Spock are everywhere. Maybe I read too much in between the lines. Spock’s Vulcan sensibilities are at its height because everyone including Kirk and Uhura have had enough of his “honesty”. 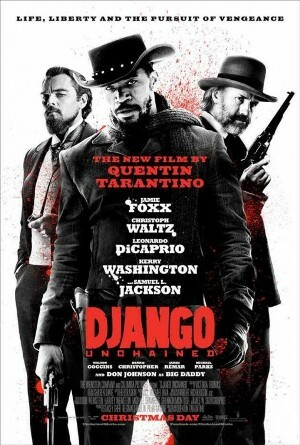 Jamie Foxx plays Django, a freed slave who travels with bounty hunter, Dr. King Schultz (Christoph Waltz) to free his wife, Broomhilda (Kerry Washington) from a cruel plantation owner (Leonardo DiCaprio). Since it opened last December in the USA, Singaporeans waited three months before it showed on the big screen and it is spectacular. Bloody mess, check. Humour, check. Badassery, check. What’s not to like? Speaking about humour, the scene involving the KKK and their cut-out masks was really funny. There they were trying to be all macho and white supremacist, but they were all complaining about a mask they were too lazy to cut their own eye holes. To me, the most disturbing scene was the Mandingo fighting scene. That was really unbearable compared to the shootout and bloodshed towards the end of the movie. Got to see Walton Goggins as the villain and oh, he does not end well. Leonardo DiCaprio was menacingly good as the plantation owner, Calvin Candie. Did you know he continued acting the dinner table scene even though his hand was bleeding after smashing into glass? That cut was used in the movie and that blood you see on Broomhilda’s face – it is Leo’s real blood. RESPECT for him and please, he deserves an Oscar ASAP! Django: Kill white people and get paid for it? What’s not to like? Emily Taylor is your average young woman, or is she not? After a botched suicide attempt after her husband’s release from prison, Emily starts see Dr. Jonathan Banks, a psychiatrist, to treat her depression. When one of her sleepwalking episodes turn fatal, is it the side effect of the new drug or has it always been in Emily’s mind, waiting for an opportunity to strike? I liked how this movie has many twists and turns and it really kept me thinking throughout the movie. Every action and reaction is crucial and relevant to the case. For a psychiatrist, Jude Law is really good at investigating. Without spoiling too much, I would say Rooney Mara did a good job handling her states of mind. I hope she won’t be typecasted to play extreme characters all the time. The loudest gasps were heard when something happened to 2012 PEOPLE’s Sexiest Man Alive. Whoops! 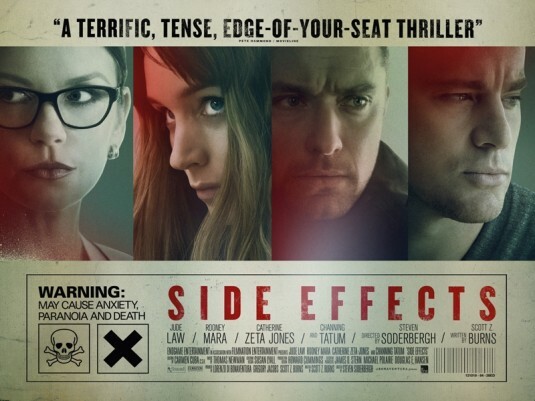 One of the best movies I’ve seen so far in 2013. Written by Wentworth Miller (under the pseudonym Ted Foulke), the story revolves around India Stoker (Mia Wasikowska) and the events after her Uncle Charlie (Matthew Goode) arrives at her father’s funeral. An uncle whom she never knew existed, she is intrigued yet infatuated with this charismatic character. 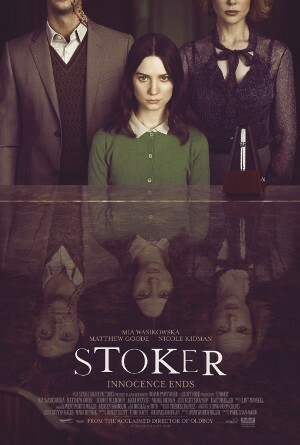 India Stoker: He used to say, sometimes you need to do something bad to stop you from doing something worse. I’ve come to appreciate Mia Wasikowska in various roles – she can be whimsical or serious and her face doesn’t give anything away. It’s a dark tale and I guess families all have skeletons in their closet, just that this skeleton is darker. One of the most intense scenes was the piano duet which I thought was well-executed by Mia Wasikowska and Matthew Goode. Something happened and wow, it’s indeed intense. If this is written by Wentworth Miller, I can’t wait for his other works. R: God, we move slow. This could take a while. OMG!!! This is one of my most anticipated movies of the year!!! Based on the book by Isaac Marion, R is a zombie unlike the others. Sure, he has an appetite for human brains but he also has an eclectic taste in music and a longing for a more cultured afterlife. He meets Julie on a raid and keeps her safe in his lair. 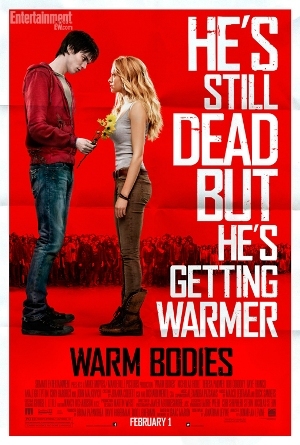 What happens is an unconventional love story between a zombie and a human being. Well, this is another movie that’s being marketed as the next Twilight but please, it is so different! There’s little variation from the book except the part of the zombie wife but that wasn’t really relevant anyway. Some parts were funny, like R’s inner monologue and how his awkwardness with girls makes him want to die all over again. R’s relationship with Julie sparks a revolution among the zombies and they are on the run from humans who wants to kill zombies and the Boneys (zombies who have lost all trace of humanity) because they sparked a revolution among the other zombies. While R has the most lines among the zombies, his friend, M (Rob Corddry) does steal the scenes when he speaks. It is quite strange to see solidarity among zombies but it goes to show not all qualities die along with civilization. The final scene is slightly different from the book but fan wouldn’t be disappointed. I won’t spoil too much of the story but it is a really nice story and everyone should go watch it. The zombies aren’t as scary as those on The Walking Dead (which I am currently crazy about) and there isn’t as much gore so people who are afraid of blasting brains should watch in ease. 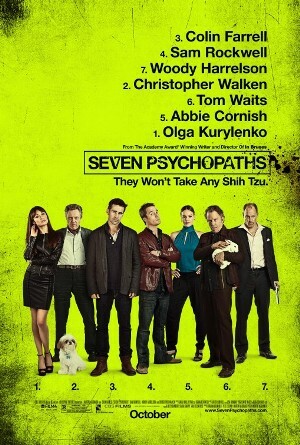 It all started with Marty (Colin Farrell) trying to write a screenplay titled “Seven Psychopaths”. His best friend, Billy (Sam Rockwell) partners with Hans (Christopher Walken) to kidnap dogs (or is it “dognap”) and return them to their owners after a reward has been offered. All goes well until they kidnap a shih tzu belonging to Charlie Costello, a gangster who loves his dog a lot. Billy: You can’t let the animals die in a movie… only the women. The back stories of the seven psychopaths were very interesting and the one that intrigued and scared me the most was the one about the Quaker, who stalked his daughter’s killer for decades. How all the psychopaths’ stories weave together in the end was pretty marvelous. Though Billy’s version of the screenplay does have lots of shootouts and gunfire. He does have an active imagination. Zachariah, the psychopath with the rabbit is also interesting considering his back story and his love for the white animal. And who knew the sight of so many rabbits can be so pleasing in a violent movie! Also, the film pokes fun of Colin Farrell’s Irish ancestry and his drinking problem. So glad to see Colin Farrell back in movies after his career slump after Alexander. Zachariah: You didn’t think I was what? Serious? You think I’m not serious just because I carry a rabbit? STAY DURING THE CREDITS FOR AN EXTRA SCENE!